Don't drink and drive? What a silly idea! How about a drive-thru alcohol shop? Yes, I am being sarcastic but the shop really does exist, and I am not kidding. Drinking and driving - That's one recipe for accidents the entire world knows about, except Lebanon, apparently. 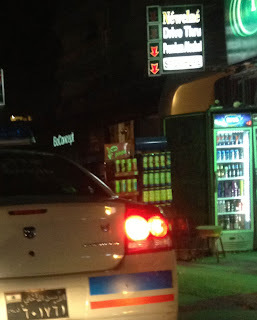 The drive-thru alcohol shop is located in Antelias, Lebanon, with people on the street ready to poor you a drink, from the comfort of your car. If you are worried you won't find the shop, pass by after dark, you can't miss it, it's the shop causing traffic. At the end of the day, all I can say is that I hope I am not in for anymore surprises in this country. I assume, by now, I have seen it all. I would, also, like to believe that the police car in front of the drive-thru alcohol shop was there to fine them, not to get a bribe or worse... get a drink! Tired of being used to this crap.